Question from a Reader: I am using Windows 10 on my desktop computer. The last week or so, Chrome will not go to any website. When I run troubleshooting, I am getting “Windows could not automatically detect the network’s proxy settings”. Is this why I can’t get to a website with Chrome or any other browser? Can you tell me what to do about network proxy settings? Click on the Chrome Menu on the browser toolbar (or type this in the address bar chrome://settings/). 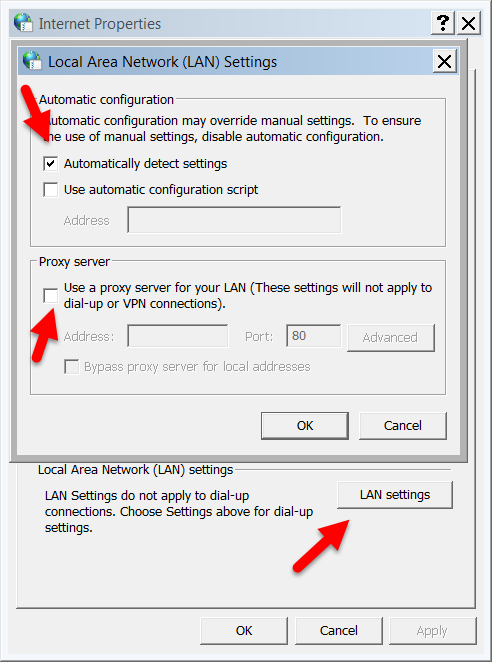 Click Change Proxy Settings in the Network section. Uncheck Automatically detect settings and make sure Use a proxy server for your LAN is also unchecked. Delete Cookies: Chrome often has cookie issues so try deleting cookies to see if that solves the problem. From the Windows Control Panel click Options, Connections Tab, LAN Settings and make sure Proxy Server is unchecked. Tap the Windows key and the X on the keyboard at the same time and then release. Then select Command Prompt (Admin) and then press Enter. Note: if this does not bring up the Command window, click or tap on the Window icon at the bottom left of your screen and then type command in the search box. Right-click on Command and tap Run As Administrator and click Yes if prompted.